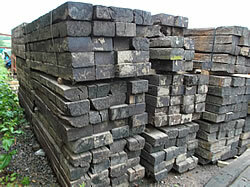 Second hand reclaimed CREOSOTED sleepers are typically 2.6m long x 150mm x 250mm (8'6" x 6" x 10"). These come in different grades, however anything less than A1 grade can sometimes be showing signs of advanced decay and can be very inconsistent in their dimensions. Creosoted reclaimed sleepers are an ideal way of soil and bank retention, as they are usually hardwood and have had a commercial creosote treatment many years ago and can be left in place without requiring re-treatment. They do however contain creosote and are not suitable to come into contact with skin, and should not be used as furniture. There are certain rules that have been in place regarding creosoted products. 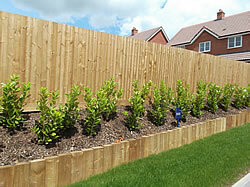 New softwood treated sleepers are better suited to a domestic garden situation when used as a raised bed where leaning and sitting on are necessary when gardening. West Country Fencing Supplies stock new Redwood treated sleepers in order to provide a longer lasting product than a whitewood variety of the same size.